Testosterone enanthate is a complex ester of natural testosterone that is widely used in bodybuilding and powerlifting. It is one of the most popular drugs for gaining muscle mass, and is characterized by long-term action (on average 2-3 weeks). Testosterone enanthate is a classical steroid drug and has a strong effect on mass gain and strength increase. Drug can also significantly increase the efficiency of trainings. Testosterone E has a number of side effects that can be minimized by the use of preventive drugs, strict diet and compliance with all dosage norms and schedules of drug taking. This drug is widely distributed over the years among bodybuilders and powerlifters. It has also excellently proved itself as an activator of body forces, a modifier of metabolic processes and an effective contraceptive. The main positive effect of the drug taking is a large increase in muscle mass and strength. This drug has a high anabolic and androgenic effect. Rapid growth of muscles is directly associated with a significant accumulation of water in the tissues, which happens due to sodium retention and estrogenic effects. The end of the course is marked by a high recoil phenomenon. The substance positively influences the development of bone structure, joints and musculoskeletal system. Excellent contributes to the relief of the first symptoms of intervertebral disc wear. Increases the oxygen capacity of the blood and has a positive effect on the entire circulatory system in general. The testosterone enanthate can be used as an extremely effective contraceptive preparation among men - according to the results of studies, the possibility of fertilization is excluded by 99.2% during the course. 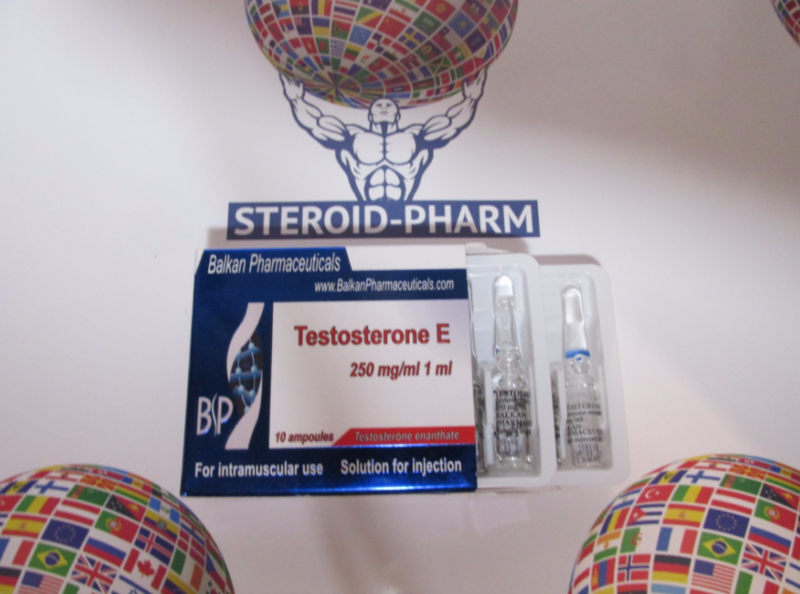 Testosterone E has a number of side effects, that are characteristic for such type preparations. Has a high propensity to aromatize, turning into estrogens. Requires the use of antiestrogens to prevent edema, fat deposits by female type and gynecomastia. Reduces the release of natural testosterone and requires accuracy with dosage and a schedule of the course of taking. Neglect and excess of recommended doses can lead to depression of the hypophysis and hypothalamus functions. In addition, the side effects of Testosterone enanthate are included in the standard list of side effects caused by steroids- baldness, aggression, increased blood pressure and acne. Dosage of testosterone E taking is tied to the state of the athlete and to his experience in taking steroids, as well as to the goals and tasks set by sportsman. The recommended dose is equal to 250-500 milligrams per week, by injection administration. The total duration of the course is 8-10 weeks, with post-course therapy that must be leaded not later than 2-3 weeks after the end of the course. For anti-estrogen therapy, aromatase inhibitors or Proviron must be used during the course. The reception of aromatase inhibitors can be finished in one week after the end of the course. Buying drugs on our website, you can count on the excellent quality, direct cooperation with the manufacturer, fast delivery and first-class service. 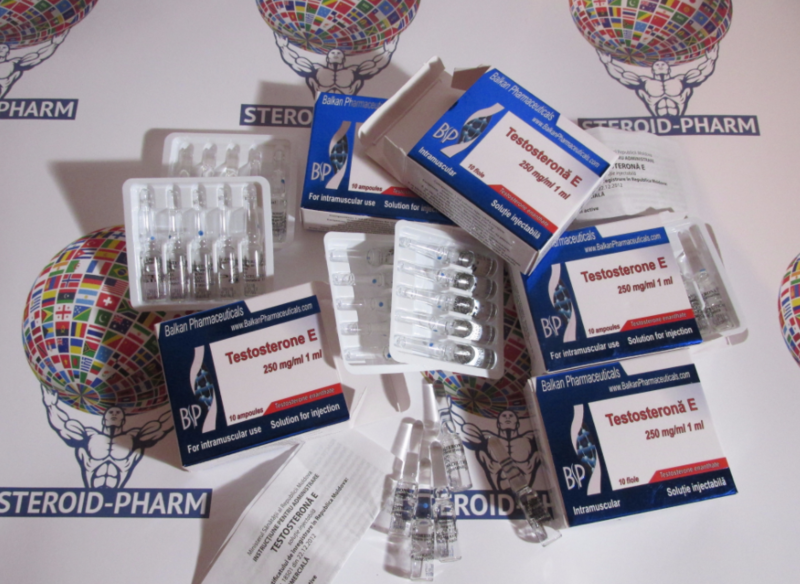 The Testosterone enanthate at the best price in Ukraine can be purchased at our website by contacting our consultants. All drugs are available on any day of the week. Reach your goals and set new ones together with our site and remember that if you want to find out your boundaries, you need to get out for them at least once.